We have searched the world over to bring you the highest quality brass bells with superior tone and finish. The rich resonance of these 12-inch (30.48 cm) brass bells when struck is guaranteed to please. 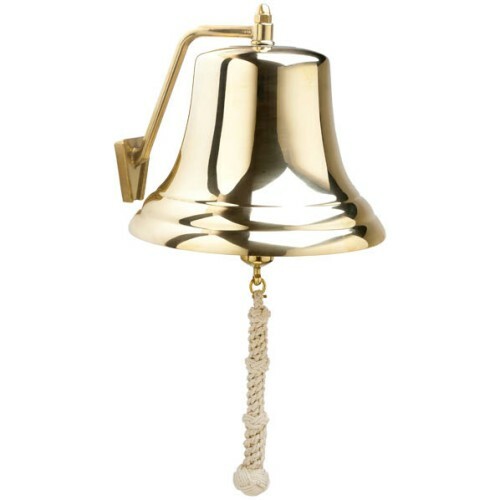 Hand-crafted in Northern Italy, their high copper content makes them stronger than most bells available on the market. They also meet the United States Coast Guard requirement for any vessel over 65 feet (20 meters). They are cast brass and polished to a mirror finish. The sturdy brass bulkhead/wall mounting bracket allows them to be easily lifted from the bracket for removal and storage when not in use. The white, hand-tied, monkey fist lanyard adds a nautical flare as the finishing touch. WARNING: This product can expose you to chemicals including lead, which is known to the State of California to cause cancer or birth defects or other reproductive harm. Wash hands after handling. For more information, visit http://www.ca.gov/.